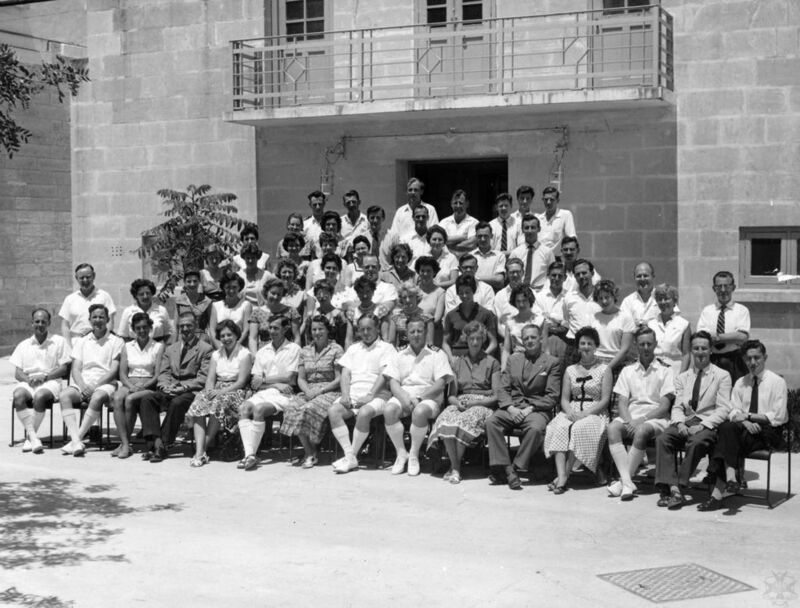 Staff Photo in front of School Hall 1959? Front row from left - ?, Lt Cdr Arthur, ?, Gordon Ruoff, ?, Tom Knight, Jackie Yule, Captain Mannering, Cdr?, ?, Charlie Eghill, ?, Lt Cdr Laws, ? ?. Could be Autumn 1959 though was in the 1960 Magazine. I think far left is Bryn Richards. Between Ruoff & Knight is Janet Hunt. Deputy Head is Lt Cdr "Yogi" Parkin. Either side of Edgell are Pat Bower & Margaret Bailey. To the left of Lt Cdr Law are Andrew Gallagher & Fred Morgan. Behind them is Richard Gerrard. At the top and second from the left is Mr. Tierney, a hero of mine, and fourth from the left is Mr. Cleaver, another. 2nd row, standing far left - Mr Stanley, our Commerce teacher.